Honing is an internal grinding process that produces a uniform size and fine finish as required in hollow parts. 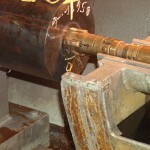 AHB uses large horizontal honing machines to hone bores from 1.5” to 24” inside diameter up to 40 feet in length. Combine deep hole drilling and honing to save money and when heavy wall tubing is not available in your size, get custom heavy wall tubing bored and honed at AHB. Call or email today so we can help!